As you may have noticed from our social platforms, we have an exclusive limited 50% off our normal rate card for all bookings for next issue for the next 14 days. This discount represents a significant saving for you and a great opportunity to showcase your product / service to all UK Schools/Academies and Senior Leadership Teams within. We have plenty of right hand pages and superb positions for you too with an incredible line up of writers, governing bodies, celebrity interviews to boot! As well as the huge discount, we are matching your purchase with free editorial space giving you maximum impact! 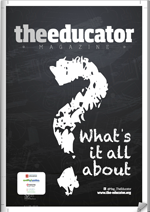 To secure your preferred position early, and save a huge 50% AND get a free editorial allocation too, email me Toby Johnson – Director@the-educator.org NOW. http://www.the-educator.org/wp-content/uploads/image1-3-1030x686.png 0 0 admin http://www.the-educator.org/wp-content/uploads/image1-3-1030x686.png admin2015-01-11 14:35:362015-01-11 14:35:3650% off all advertising!